Talk to yourself. It will bring about wonderful things. 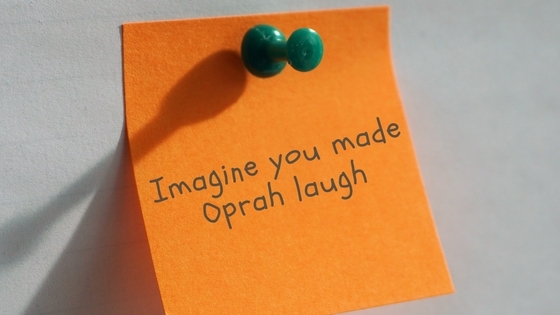 Oprah has a really great laugh. Have you heard it? It hearty, strong, and authentic. I want to hear it in person. It’s making me chuckle just thinking about it. Look at that, I just laughed, and I feel great! When I’m building experiences for people, I always ask myself “Where is the delight in this? Where is the emotional reaction?” If you’ve been to a workshop or had a coaching session, you’ll know that both tears and laughter are de rigueur. Just thinking of making someone laugh reminds me to insert humor and personality into everything I do. Yup, I am my own worst critic. I allow myself to think things like this because I too get scared about the future and what it might bring. I worry that I’m making the wrong decisions, taking the wrong path, making the wrong investments in both time and money. My worry voice, that a**hole in my head, is LOUD. Go find a giant piece of paper. The biggest one you can find. And in big bright letters write down the things you want. The wants your inner critic says you can’t have. Then stick it up in a place where you can see it. Each time you pass, if you need it or not, just say the sentences out loud.